Ultra AutoCannons, or UACs, are an advance in AutoCannon technology that seeks to boost the weapon's damage-per-second (DPS) by increasing rate-of-fire. With roughly twice the rate-of-fire of a Standard AutoCannon and only slightly lower damage-per-shot, Ultra AutoCannons deal out almost twice the punishment in the same amount of time. The down side of these weapons is that they can overheat with prolonged firing which will result in a lengthy cooling period. This is especially true of the heavier UAC10 and UAC20, which are capable of dealing tremendous damage but have a limited window to do so. As with Standard AutoCannon, rounds fired from Ultra AutoCannons may strike targets at greater distances than the listed range. Because of the longer flight time of the round and the ballistic trajectory (requiring the pilot to aim high to compensate) it is often difficult to strike actively evading targets in this manner. Even so, this can allow a UAC to strike a target at surprisingly long range (with the UAC2 actually capable of damaging units at up to 1,250 meters away). The Ultra AutoCannon-2 is primarily used as an anti-aircraft weapon since its high rate-of-fire makes them a nightmare for fighters. Likewise they are an effective anti-Battle Armor and anti-hovercraft weapon. It also carry more ammunition in a ton compared to the AC2 or AC5, however their doubled rate of fire means they also run dry much more quickly. Because of how rapidly it shoots, the UAC2 can even prove to be a threat to heavily armored units despite dealing Light Kinetic damage if the shooter is able to maintain fire on their target. The Ultra AutoCannon-5, as of 0.8.5, is more similar to the heavier UACs than to the UAC2, as it instead fires a quick burst as opposed to the UAC2's sustained barrage. Again unlike the UAC2, the UAC5 deals Light Kinetic damage, which is more suitable against light to medium targets. A battery of UAC5s, such as those found on the Mad Cat MKII E can rapidly disintegrate even an assault 'Mech when used with precise targeting. As of 0.4.5 there was no observable difference between the Clan and Inner Sphere versions of the weapons. Both the Ultra AutoCannon-10 and Ultra AutoCannon-20 are prime assault weapons that feature both high burst damage and impressive DPS. The main drawback of these weapons is they carry so few rounds in a ton (UAC10 48Ammo/ton UAC20 32Ammo/ton) making it easy to run dry if care isn't taken. Because of this it is best to resist the temptation to take chancy shots and instead make sure every shot counts, otherwise a pilot may find themselves making many trips back to base for ammo. 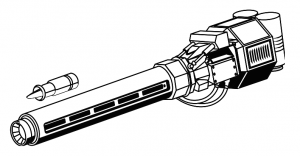 The first Ultra AutoCannon introduced was the UAC5 in 2640 by the Terran Hegemony. Although the Inner Sphere would completely lose the technology in 2915 due to the destructive Succession Wars the Clans went on to introduce the UAC2, UAC10, and UAC20 in the 2820's. As with the LBX10, the secrets to the UAC5 would be rediscovered in the Inner Sphere with the help of the Helm Core in 3035 and the pressures of the Clan Invasion would lead to them to also introduce the UAC2 and UAC10 in 3057. An Inner Sphere version of the UAC20 didn't appear until 3060. In Classic BattleTech the Clan versions of the UAC are significantly lighter and more compact in addition to having an advantage in range. Additional weapon characteristics include an ability to switch between standard and ultra firing modes, with the weapon behaving like a Standard AutoCannon while in standard mode and firing twice while in ultra mode. Operating in ultra mode carries a risk that the weapon will burn out and be rendered useless for the remainder of the battle, however.